A photograph recently sent to the editor of the Chain Gang Gazette, the Frazer Nash Car Club’s magazine, has created quite a stir. This particular GN was bought by George Walmsley of Cleator Moor, Lancashire in May 1911 and is referred to in a couple of David Thirlby’s books as being the first GN ever sold to a private customer. 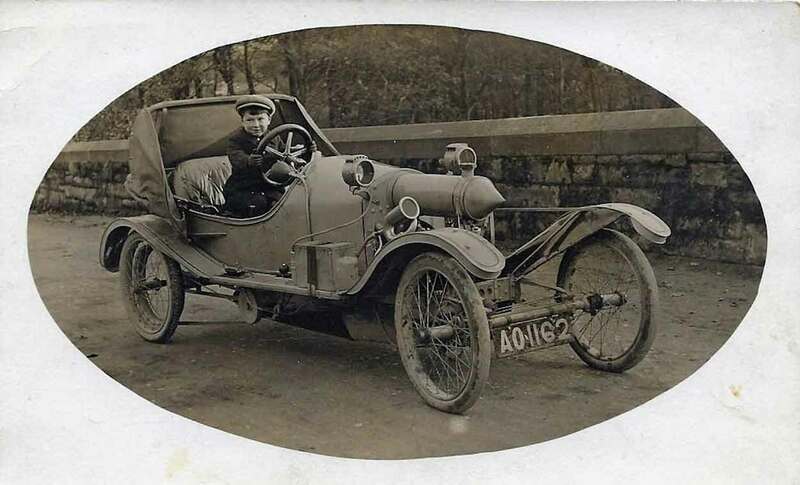 The photograph, taken in 1912, was sent in by Barrie Walmsley who is the grandson of George and it shows Barrie’s father sitting behind the wheel as a very young boy. The appearance of this photograph in the Chain Gang Gazette has prompted two Club members who are dyed-in-the-wool GN enthusiasts to conduct some further research as to whether this really is the first commercial sale of a GN. Whilst the Archives holds very few early GN records, the excellent GN Sourcebook was able to provide some relevant information. It transpires that almost at the same time another GN was “sold” to a Mr. Cecil Whitehead (who at one point was a director of GN Ltd.) and at present there is some speculation as to whether this was a commercial transaction or whether it was a rather crafty marketing ploy. We are especially grateful to Barrie Walmsley for sending the photograph, and to Club members Roger Harrison and Arthur Gibson for their sleuth work in piecing together all the facts.